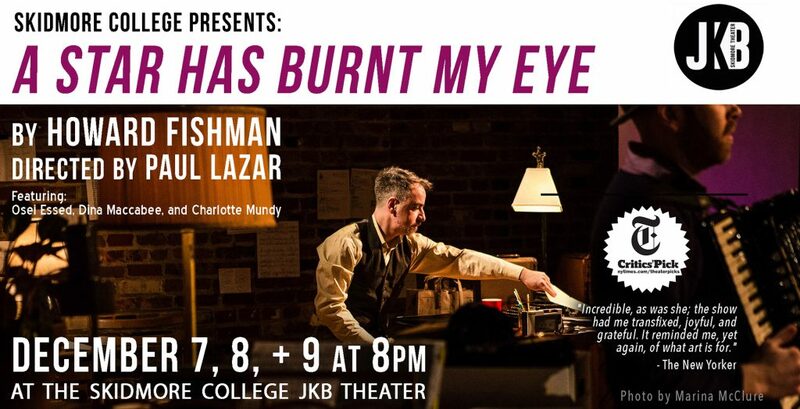 This past weekend Skidmore College Theater hosted a limited engagement run of A Star Has Burnt My Eye written and performed by our latest Artist-in-Residence, Howard Fishman, and directed by award-winning director Paul Lazar of Big Dance Theater. The production had its world premiere at BAM (Brooklyn Academy of Music) about a year ago in November of 2016 and since then was a New York Times Critics’ Pick. 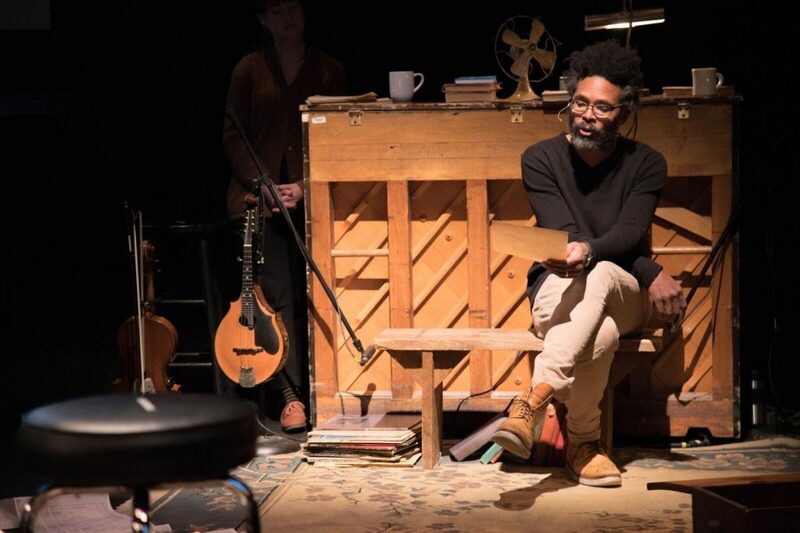 During its residency at Skidmore College, the show also featured performances by Osei Essed, Dina Maccabee, and Charlotte Mundy. 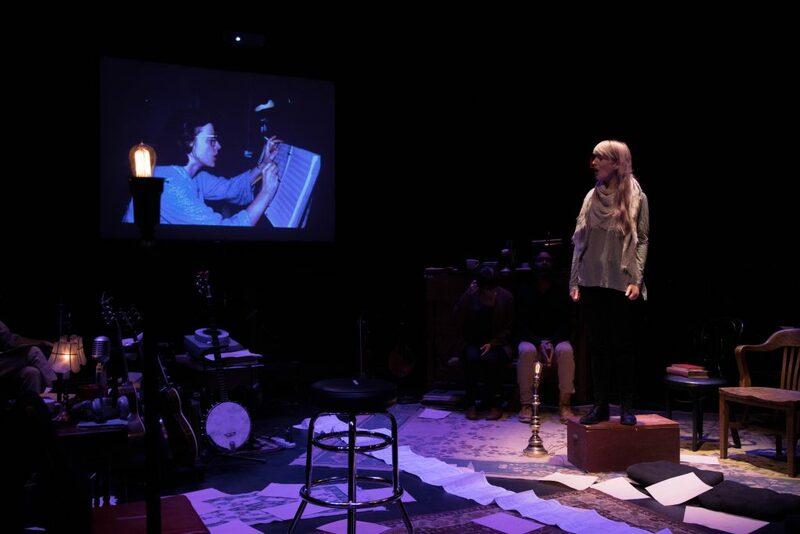 A Star Has Burnt My Eye is a multimedia theatrical meditation on the life and music of polymath Elizabeth “Connie” Converse (1924 – ? ), who some have taken to calling “the first singer-songwriter.” A prototype of the DIY artist, Converse wrote and self-recorded an extraordinary collection of songs in the early 1950’s before deliberately vanishing years later having given up on finding an audience for her music. 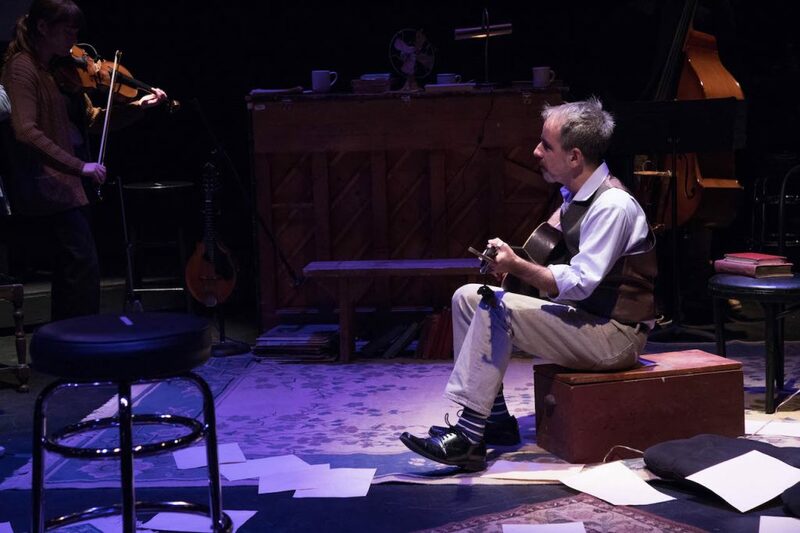 The show features a group of New York musicians, led by playwright and composer Howard Fishman. They perform her songs, read from her letters, and make the case for Converse’s particular genius and her belated status as a great lost American artist. The cast and director did a beautiful job breathing new life into this production and four senior theater students at Skidmore had a big hand in it’s resurrection. I got a chance to ask these four seniors a couple questions about their respective roles in the process and figure out what it was like to work with these talented professionals on this one of a kind product. I acted as the Production Assistant, which was a wonderfully flexible gig. Basically, I would be in the room for every rehearsal, and I would float around filling in wherever I was needed. 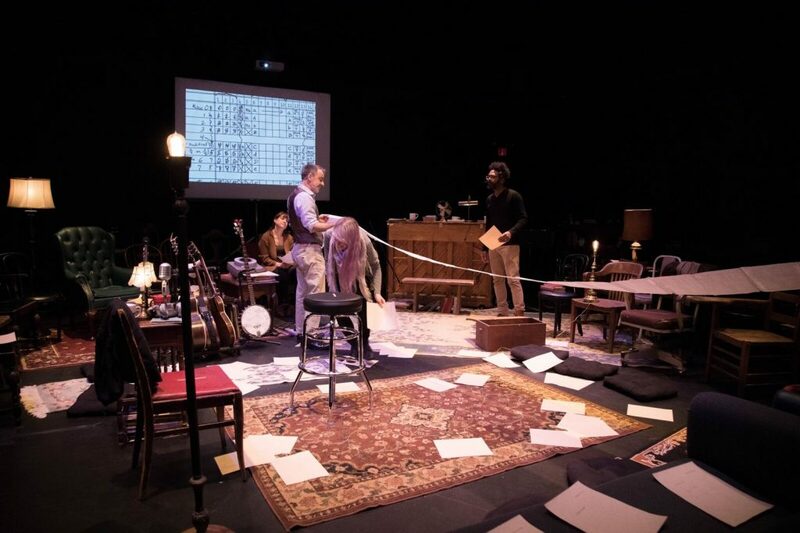 I would help Nic (the Stage Manager) with pre-sets, help Paul (the director) take notes, and contribute thoughts on some moments in the play that were still being workshopped. What’s this show to you? This show started as Howard’s passion project, and although he’s still very much at the center of it, it’s taken on a new life. This show is now an all-hands-on-deck mission to immortalize not just Connie’s music, but her entire eccentric persona. It’s an incredibly intimate story, it focuses on one woman and her music. Though a small-scale example, Connie is only one of god knows how many real, fascinating, mysterious people who have been swept under the rug. What’s been your favorite part of working on this show? Experiencing a perspective on theater that’s outside of what we do in Company is such a welcome change. It’s a really exciting exercise in ensuring that you’re opening yourself up to more than one point of view. I’ve had a lot of fun sitting in on rehearsals every day, and seeing how collaborative and creative their process is. It’s a huge privilege to get to have so much input in shaping a performance, and watching the ensemble speak so passionately about their show has been really informative to me. What role did you play as ASD and PM? Primarily what this meant for this show was that I was responsible for executing the props and scenic requests; this included dressing the set, acquiring various props, designing sheets, and pulling our existing props from the props closet. This show is about recognizing a passionate and infinitely talented woman, and sharing her wit and beauty with an audience. I don’t know if I could speak to why this show is important in a bigger sense, but I will say that this show is very important to me. To hear about a person so full of talent and love for their art is a wonderful thing, and then to know that not every person who deserves recognition receives it is a powerful experience. It’s like reading a myth. What’s been your favorite part of working on the show? The progress of the production has been my favorite part. I enjoyed watching the changes happen in the show as the performers and creative team came to realizations about what the show can and should be. On top of that, getting to work with a team of people who were so interested in collaboration, and who brought both joy and professionalism to the process was a terrific experience. What is this show about to you? To me, this show is a tribute to forward thinkers, told through the story of Connie Converse’s life. It is a tribute to women and their ideas, and an investigation of why people who are progressive thinkers are often ignored. As an unbelievably talented young woman, Connie Converse is an amazing and empowering example of female independence and strength. Her music was way ahead of its time, and although the end of her story is somewhat dark, her life was truly inspiring. What’s been your favorite aspect of working on this show? I enjoyed how short the entire production process for this show was. I really like short periods of high-intensity work, and we were able to come up with clever solutions to lots of complicated problems in such a short period of time. I also enjoy the engineering side of audio a little bit more than the design side, so getting to mix a show for four talented, professional musicians was very fun. What’s it been like to work with people who you don’t usually find around the department? It’s awesome that Skidmore was able to bring this company of professionals to the JKB. I think that having the opportunity to work with new people was not only a lot of fun, but important from a networking and professional development point of view. Working with people who are used to working in “real-world” theaters was fantastic since I was able to see how a real company operates and how that differs from how we usually work in an educational setting. What’s been your role in this process? I was co-lighting designer with Jared Klein and ran the light board during the show. To you, what is this show about? It’s about spreading word of and teaching people about Connie’s life, her music, and the underlying ideas of persistence, recognition, and societal expectation of how we fit or don’t fit in. It looks at a woman who was doing remarkable things and who kept being who she was, even when everyone was telling her she couldn’t or shouldn’t. This show is particularly poignant for a lot of us here because we are all going through a transitional phase in our lives during college; trying to evaluate who we were, who we want to be, and how to balance that in a world that wants to put us in labeled boxes. Learning to persist despite that, and regardless of how long it may take, is something I think we can all take away from this show. The company, a hundred percent! Everyone is so professional and so willing to work quickly and efficiently, but also collaboratively, and that’s something that’s been great to experience as someone who wants to go into this field professionally. Also the music is just absolutely beautiful, I’ve been singing it to myself non-stop since I’ve started working on the show. Ziggy Schulting ’18 is an English/Theater double major and co Editor-in-Chief of the Living Newsletter.